I am a postdoctoral researcher jointly appointed between DIMACS at Rutgers University (January-August 2019) and the Institute for Advanced Study in Princeton (September 2019-August 2020). Prior to this, I was a research fellow in the Lower Bounds program at the Simons Institute for the Theory of Computing at UC Berkeley. I received my PhD from the University of Toronto, where I was a member of the DCS Theory Group under the supervision of Toni Pitassi and Stephen Cook. My primary area of research is computational complexity theory, with an emphasis in circuit complexity, proof complexity, communication complexity, and related topics. I also have a deep interest in the theory and practice of SAT solving and model checking. Robert Robere, Antonina Kolokolova, Vijay Ganesh. Lifting Nullstellensatz to Monotone Span Programs over any Field. Paul Beame, Noah Fleming, Russell Impagliazzo, Antonina Kolokolova, Denis Pankratov, Toniann Pitassi, Robert Robere. Random Θ(log n)-CNFs are Hard for Cutting Planes. Noah Fleming, Denis Pankratov, Toniann Pitassi, Robert Robere. Strongly Exponential Lower Bounds for Monotone Computation. Exponential Lower Bounds for Monotone Span Programs. Robert Robere, Toniann Pitassi, Benjamin Rossman, Stephen A. Cook. Invited to the special journal issue for FOCS 2016. Path Graphs, Clique Trees, and Flowers. Lalla Mouatadid and Robert Robere. When Almost Is Not Even Close: Remarks on the Approximability of HDTP. Tarek R. Besold and Robert Robere. Awarded the Cognitive Science Society Prize for Best Student Paper. A Note on Tractability and Artificial Intelligence. Average Case Lower Bounds for Monotone Switching Networks. Stephen A. Cook, Yuval Filmus, Toniann Pitassi, Robert Robere. Complex Analogies: Remarks on the Complexity of HDTP. A Change for the Better? Assessing the Computational Cost of Re-representation. Todd Wareham, Robert Robere and Iris van Rooij. International Conference on Cognitive Modeling [ICCM 2012]. Package for converting a halfspace representation of a polytope into a vertex representation of a polytope. Written in the R programming language (a port of lrslib, written by David Avis). Consider the following problem: we are given a collection of sets of isotopic measurements (perhaps measuring the concentration of some particular isotopes of carbon and nitrogen, for example) taken from a fixed "predator" species and a collection of "prey" species for which we know the "predator" preys on. In an ideal world, the set of measurements from each predator would be a convex combination of the isotopic measurements from some samples of the 'prey' distributions, and using standard machine learning techniques (Gaussian mixture models) we could get an estimate of what proportion of each type of 'prey' the 'predator' sample is eating. Unfortunately, the world is not ideal in this way, and typically the above experiment can only be run up to certain "error terms", which are known in the computational ecology literature as discrimination factors. EDFIR (Estimating Discrimination Factors in R) is a collection of functions for reading in data sets of isotopic measurements and generating a prior distribution of discrimination factors for later input into a Gaussian mixture model. Joint work with Alex Bond. 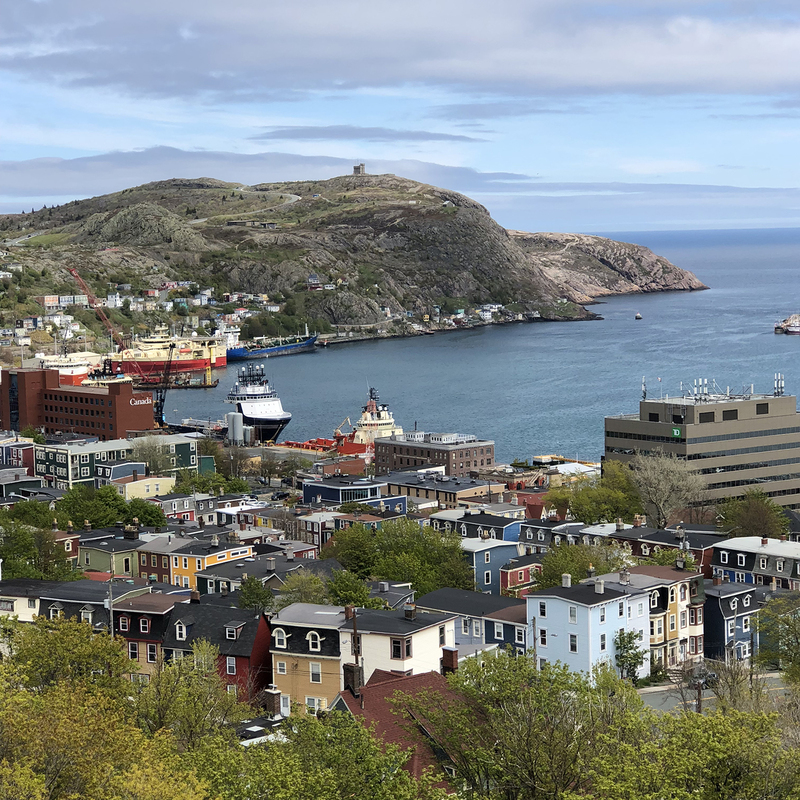 - I was born and raised in St. John's, Newfoundland, which is the best place on earth. When I was 22 I moved away for graduate school and, as you can see from the picture, this was obviously a mistake. - I do a lot of rock climbing, particularly outdoors. Here's a picture of me climbing in Red Rocks, which is outside Las Vegas (in the blue shirt). Places I've climbed include: Red Rocks, Yosemite, Utah, The New, Newfoundland, and essentially every crag in Southern Ontario. - Before graduate school I was heavily involved in theatre. As a student I performed with (and then later instructed for) the Canadian Improv Games in Newfoundland. I was also a founding member of the theatre group Stanley Braxton, which is still running today!